It's been three weeks since the US Presidential election and I'm still processing what happened. It should be no secret that I am disappointed in the election result but what is important now is to understand what happened (and why) and make some sense of it to inform the way forward. I didn't support Donald Trump as a candidate in the primaries or in the election. I'll blog in greater detail later but I've analyzed his career and found him not to be a very inspiring businessman (There's a reason why there are business school cases about many other billionaires but not about Trump.) - more successful as a Kardashian-like reality TV show "brand" than as a magnate. Moreover, the litigious, dishonest way that he has conducted not only his career but his campaign turned me off to him. Now, weeks after the election, we can see how hypocritical he is as well: promising to "drain the swamp" and "shake things up" in Washington - while appointing insider after insider to Cabinet positions. Despite all that, he still won the election - so what happened there? One narrative is that "the people have spoken" and that a "bloodless revolution" has sent a clear message against the policies of the Left. I don't find that compelling as, with something like 100k votes (out of 125m) going the other way, it would have been a Hillary landslide in the electoral college. Coupled with Obama's high presidential approval rating, the decisive popular vote win for Hillary and the net loss of Republican house and senate seats, the main message for me is that we, as a nation, are more sharply divided than ever. This election was emblematic of the growing divide between urban and rural, between more educated and less educated, between the haves and the have nots, and of the disenfranchisement of a significant segment of the population that is feeling increasingly unheard and abandoned. So it's not unanticipated that Trump wouldn't have appealed to me. He wasn't talking to me; he was talking to people who believe that I - and people like me - am being well served at the expense of people like them. And that may be a fair assessment. As I work feverishly to build a company, it will create jobs largely for . . . educated urban "elites" like me. So let's consider this election a splash of cold water in the face - of a part of America saying, "Hey! Don't forget about us!" (And let's not focus too much on the fact that the man they hired for the job has a long history of screwing the little guy or that my most ardent conservative friends are fond of criticizing "bleeding heart liberals" for wanting to help the little guy. When it comes politics, hypocrisy knows no bounds!) That's an important take-away and it should inform the path forward. As disappointed as I was in the outcome of the election, I was many fold more disappointed in the process by which President was elected. My biggest gripe about this election is that it threw facts right out the window. This "post-truth" era we seem to have entered into makes me want to pull my hair out (ha!) every time I see obviously false, deliberately misleading, or otherwise untruthful information being banded about as fact. The rise of "fake news" sites and the amplification of their disinformation by social networks was a huge problem but we don't really have to look farther than the president-elect himself for demonstrably false proclamations that were bought by a substantial portion of the electorate. The lack of critical thinking and the increased prevalence of self-reinforcing echo chambers (on both sides) is a tremendous danger to democracy. I'm quite bullish on democracy as a political system, but it is still just a system - and garbage into said system will produce garbage out. As a consequence the actual issues of the election were almost never discussed. From primaries to conventions to debates, there was very little attention paid - by candidates or by media - to the actual issues. Instead everyone focused on goofy conspiracy theories, unsubstantiated allegations, and character assassinations. Shame on all of us for being complicit in letting that approach carry the day. Instead of turning off the TV coverage and passing over clickbait headlines, we indulged and perpetuated it. Kudos to Trump. As a reality TV star, he turned an election - where his politician opponent had an advantage - into a reality TV show - where he clearly had the advantage. Finally, this was the most interfered with election I have witnessed. From leaked tapes to FBI announcements to wikileaks emails, this election was the most influenced by outside manipulation that I ever remember. To be clear, I am decidedly in the just-because-the-emails-were-hacked-by-Russians-doesn't-make-them-less-true camp. However, when we only get hacked emails from the DNC and not the RNC, it creates information asymmetry and shapes public opinion. We make judgments on the DNC emails but don't have the ability to compare them to judgments on RNC emails. In an election in which so many people reported choosing between which candidate they disliked least, such asymmetry is bad for business. Personally, I suspect we would have seen just as reprehensible behavior in RNC emails. These shortcomings in electoral process opened the way for an election to be won on charisma - rather than on qualifications or on issues - demagoguery - rather than civil discourse - and fear - rather than hope. Tribalism - Just as you see with fans of rival sports teams, there is an increasing trend toward tribalism in today's politics. I watched as Republican friends who hated Trump in the primaries talked themselves into supporting him just because he was representing their tribe. I watched as friends on both sides refused to acknowledge any common ground with the other side because . . . tribes. I observed the increasing use of labels like "libtard" being used to describe any member of the other tribe. Frankly this type of tribalism reminded me a lot of what we saw in East Africa: there were no machete deaths but the vitriol seemed just as genuine. And indeed in the election states seemed more polarized than ever by tribes (parties). Anti-intellectualism - there seems to be a war on rational discourse. Anything that isn't explained in a meme is discounted as biased propaganda - and then of course most of the memes are incredibly fallacious. There are so many instances of, "Well, I just feel that this is the truth," not just on Facebook walls but by public figures as well. Anti-establishment - Bernie Sanders was the other side of the Trump coin. Clearly there was - and presumably still is - a groundswell of anti-establishment sentiment. Selfish myopia - Trump Campaign Manager Kellyanne Conway put it succinctly in the election post-mortem: ""There's a difference to voters between what offends you and what affects you." It is natural for people to try to simplify a complex decision like an election to a single issue because that is easier to solve. Voters were willing to turn a blind eye to aspects of decency and policy as long as they were told that their particular issue would be addressed. In hindsight that seems obvious. Both major political parties are totally broken. Neither represents the vast majority of centrist Americans. And I don't think anyone is taking action to fix that; rather they're just digging in their heels to become even more polarized. Heads in the sand - The world is changing. Technology is changing. And a major segment of the population is voting to stay behind because that is more familar. As one example, let's look at manufacturing. 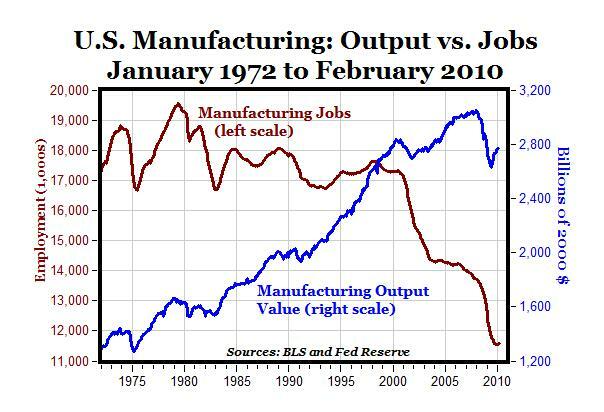 A narrative in this election was that US manufacturing has fallen due to outsourcing. When you look at the data, though, manufacturing in the US is huge! We just don't need as many humans to do it because we've been become more productive through process improvement and technology. “Dark times lie ahead of us and there will be a time when we must choose between what is easy and what is right." - Albus Dumbledore | It is easy to put our hands over our eyes and blame scapegoats like Mexico and China for these job losses but it is right to think longer term about the implications of the changing nature of work in this and other industries. I don't get the impression that anyone is doing that right now. At the end of the day, this election is what it is, and we must now move on and deal with it. I'm disheartened that I don't believe the government represents what I care about most. Thus I am more resolved than ever before to be the change I hope to see. Rather than looking to the government for solutions to social problems I continue to work to create those solutions myself through capitalism.